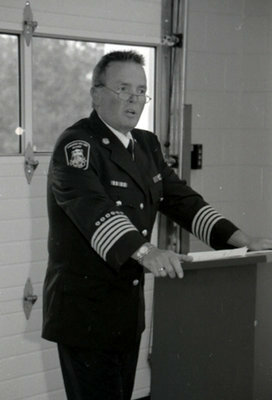 A black and white photograph of Fire Chief Kent MacCarl speaking at the opening of the new Brooklin Fire Hall on September 18, 2006. In 1857 the Town of Whitby had its first fire brigade and hook & ladder company entirely made up of volunteers as a result of a by-law passed by the Town Council. In 1879 the fire truck was housed at the Town Hall building (Brock and Colborne Streets). It was not until 1969 that the Town of Whitby hired its first full-time employee, Fire Chief Ed Crouch. The following year the Town hired the first five fire fighters thus ending 120 years of volunteer service. The Whitby Fire and Emergency Services now consists of five fire halls and 115 staff members. Opening of the Brooklin Fire Hall, September 18, 2006, Carl Ferencz. Whitby Archives A2013_012_002D.